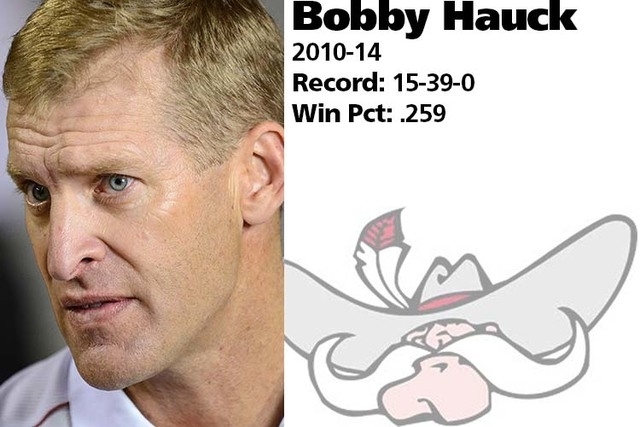 Hauck went 15-49 in his five seasons. His best season was in 2013, when he led the Rebels to a 7-6 record and their first bowl berth since 2000, losing 36-14 to North Texas in the Heart of Dallas Bowl. But he won only two games in each of his other four seasons. He never put together a winning record, but came close to breaking even with 5-7 records in his final two seasons. His other three seasons ended with two victories apiece. 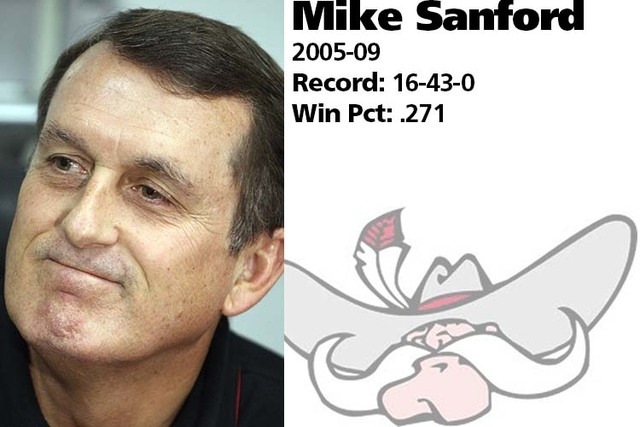 Sanford finished 16-43 in five years. 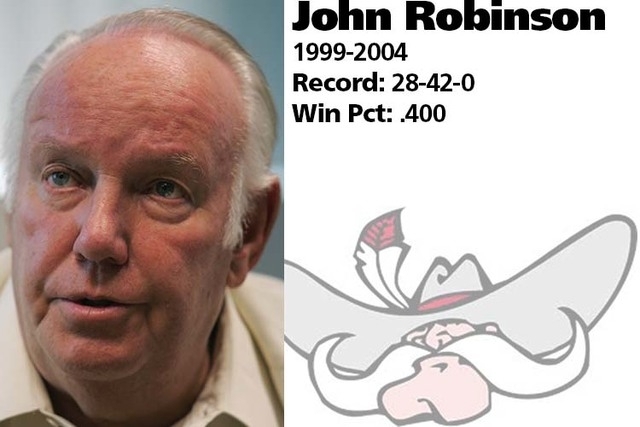 Robinson, the former Southern California and Los Angeles Rams coach, took the Rebels to the Las Vegas Bowl in 2000, beating Arkansas 31-14 and finishing 8-5. But that was his only winning season, though Robinson came close at 6-6 in 2003. He finished 28-42 in six years. His first season was his best, going 7-5 with a 52-24 victory over Central Michigan in the Las Vegas Bowl. 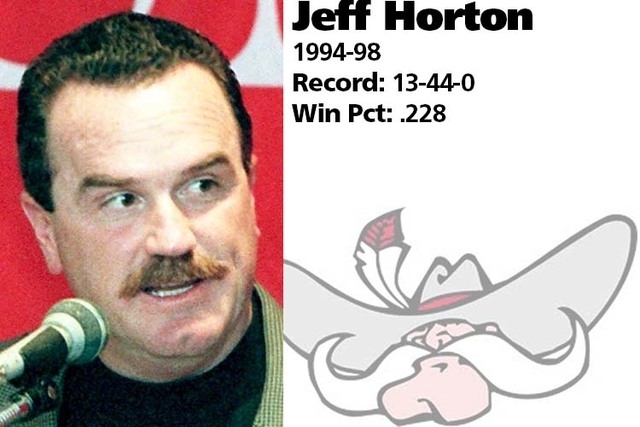 But Horton won only six games over the following four seasons, including 0-11 in 1998. He finished with a five-year record of 13-44. 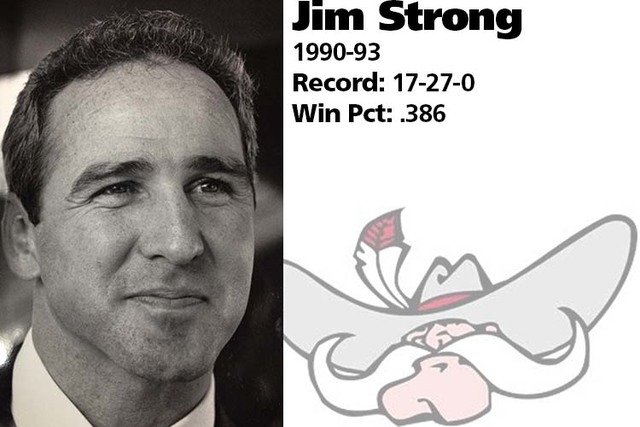 He produced one winning season, going 6-5 in 1992 for the Rebels’ first winning record in six years. One year later, he went 3-8 in what became his final season. Strong went 17-27 in four seasons. 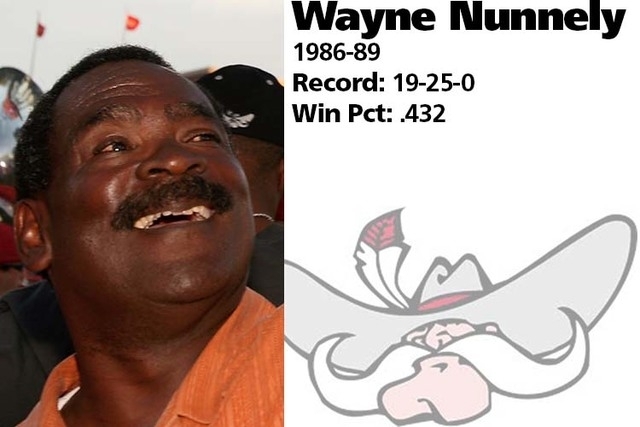 After going 6-5 in his first season, Nunnely failed to put together a winning record in his final three years. He finished 19-25 in four seasons. Nunnely was the first former UNLV player who also served as head coach. 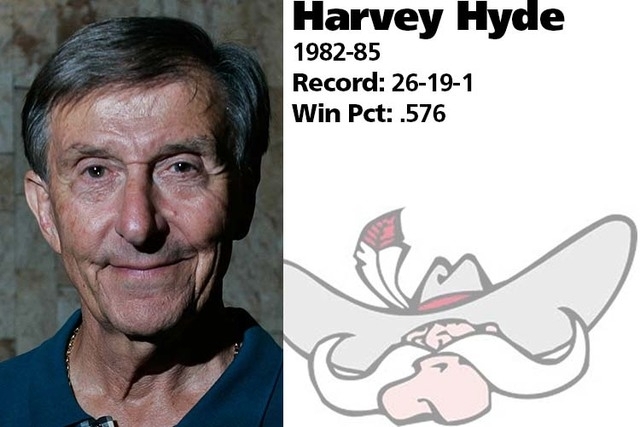 Hyde was the last coach to leave UNLV with a winning record, going 26-19-1 in four seasons. His best season came in 1984 when the Rebels went 11-2, won the Big West Conference title and beat Toledo 30-13 in the California Bowl. The Big West later erased UNLV’s record for using ineligible players, but the NCAA recognizes those victories. The Silver Fox produced five winning records and one .500 mark, going 47-20-2. 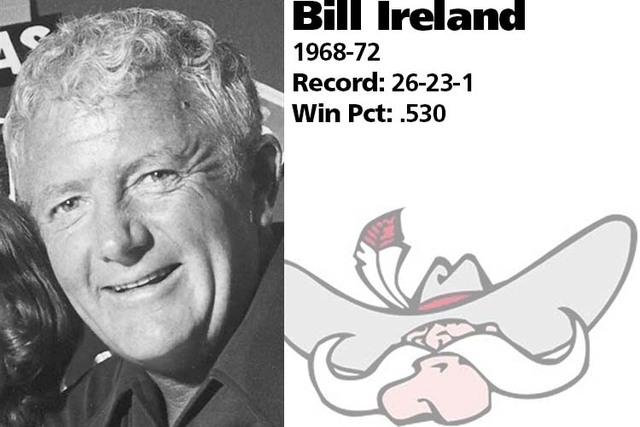 He also was the coach when UNLV moved into Division I in 1978, and the Rebels went 7-4 before losing 28-24 to Brigham Young in Japan at the end of the season. 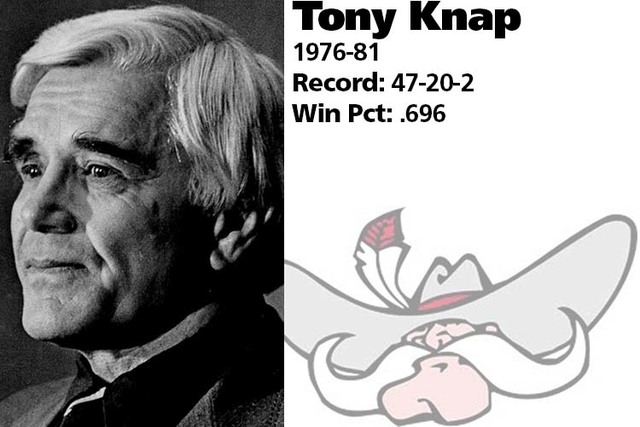 Plus, Knap won nine games in each of three other seasons. 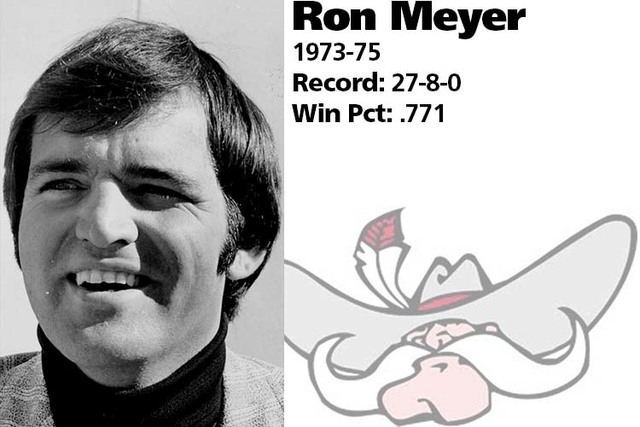 He stayed only three seasons before heading to Southern Methodist, and in that time at UNLV, Meyer went 27-8. In 1974, the Rebels went 12-1 and made the Division II semifinals before losing 49-11 to Delaware in the Grantland Rice Bowl in Baton Rouge, La. 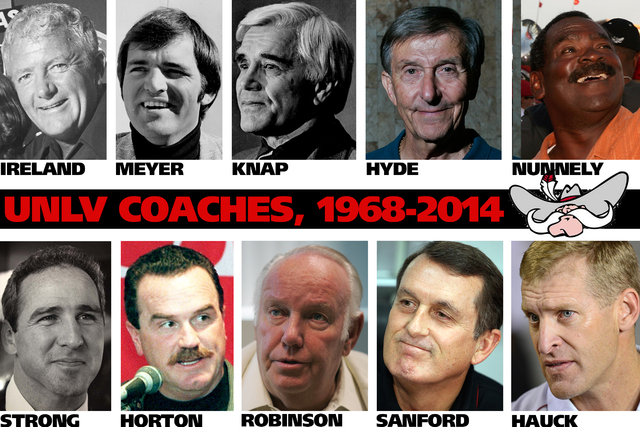 Meyer also went on to coach the New England Patriots and Indianapolis Colts. The father of UNLV football, Ireland won his first eight games and finished 8-1 in that inaugural season. He had winning records in his first four seasons before going 1-10 in 1972, finishing 26-23-1 in five years. Ireland went on to become the Rebels’ athletic director from 1973 to 1980. Click on the photo above to see the overall record and win percentage of each coach through the program’s 46-year history.